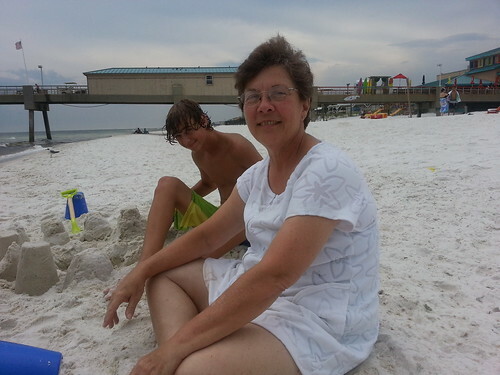 Will taught an adult Vacation Bible School last week at First Baptist Church of Fort Walton Beach. So, we decided to make one last camping trip of the summer. While we were there we took the time to hang out with family. Every morning the kids and I took a walk, rode bikes and went swimming in the pool while Will was teaching. Luke is getting much better at swimming with no floats. 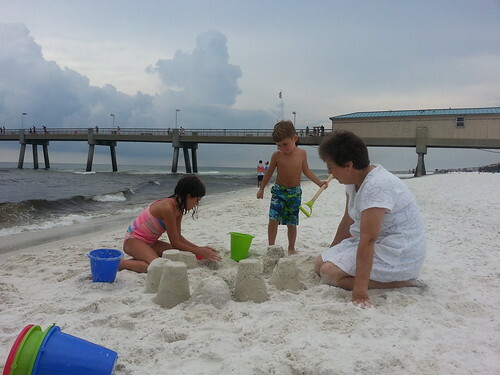 Monday afternoon, we met Grandma at Goofy Golf in Fort Walton Beach. 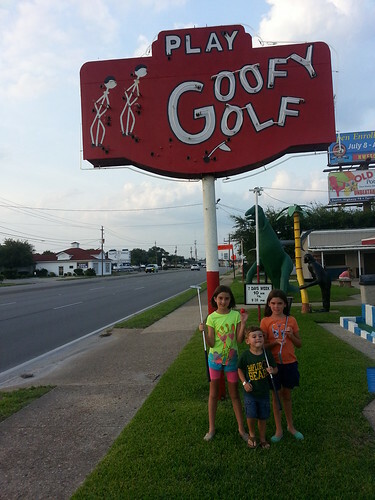 I told the kids we were going to play Goofy Golf. 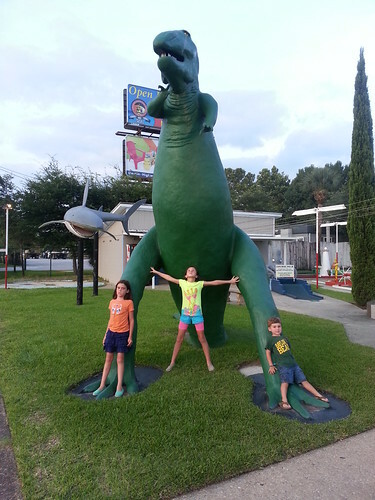 Their response was, “What’s that?” I tried to explain… putt putt, miniature golf, anything along those lines. Then I realized that my kids have never played anything like that. I think we win the award for biggest parent fail of a childhood classic. 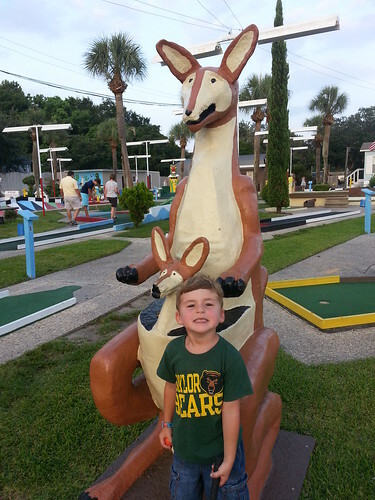 A ten and eight year old have never played miniature golf. Sad. 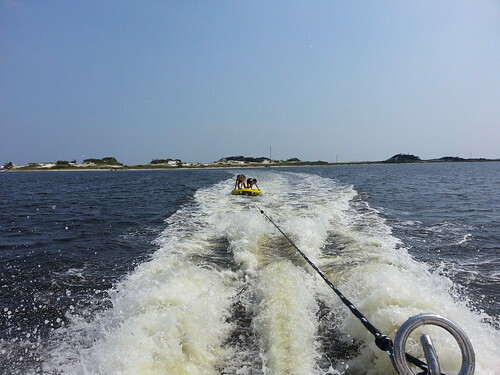 On Tuesday afternoon our friends came down with their boat for some tubing and relaxing. 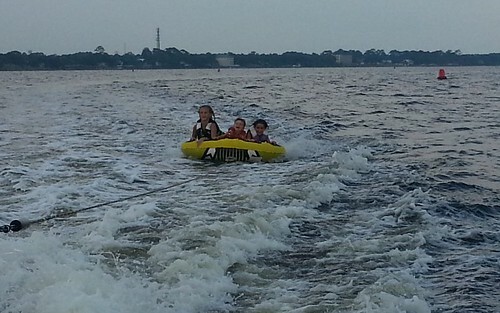 Here is Luke with Jada and Isabelle. He grinned and played the entire time. He kept putting his hand up trying to make the motion for ‘faster’. 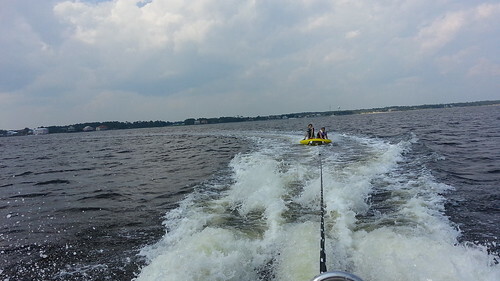 Jada and Isabelle trying to stand up on the tube. Isabelle is on the right bent over trying to stand. Anna wasn’t on it a full minute before Josie tried to stand up. I thought maybe my kids might think twice about it, but as soon as Josie stood up, Anna was trying to get herself up there. She is on the left on her knees in this picture. This was also Luke’s first ride on a boat (other than those of the Disney nature). 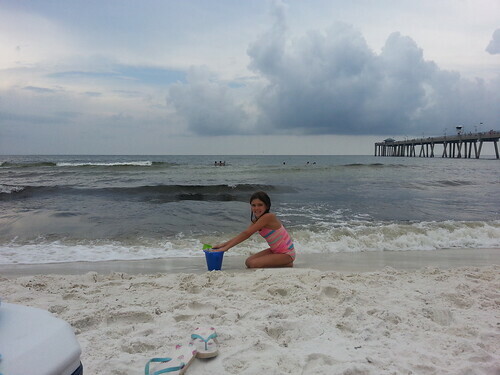 We had a great spot that we pulled up to with no one else around and we were relaxing and playing until a storm popped up. We zigged and we zagged and we made it around the thunder storm but we still got rained on as we headed back to the boat ramp. 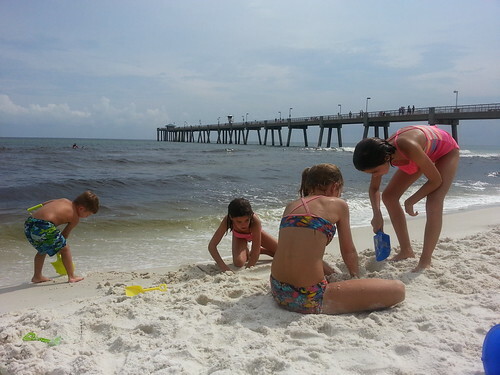 The kids can’t wait to go again! Wednesday afternoon we went back to the beach on the gulf side and the seaweed was everywhere. Will said, “come on, once you get past the initial part, it goes away.” After watching them for a few minutes I got brave enough to try it… Let me just say…he was wrong! It was still bad. Still gross. Still not something I could handle. So we left the gulf side and went back to the bay side. Much better. We caught hermit crabs and regular crabs. The kids walked out a really long way with Will. Then a storm popped up again. I tell ya, Florida and these afternoon thunderstorms! 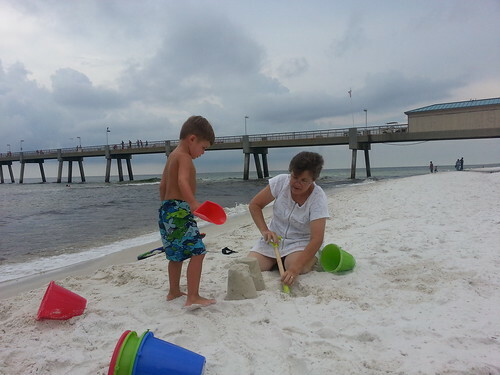 On Thursday, we met Will’s mom and Parker and Graci on Okaloosa Island for some more beach fun! 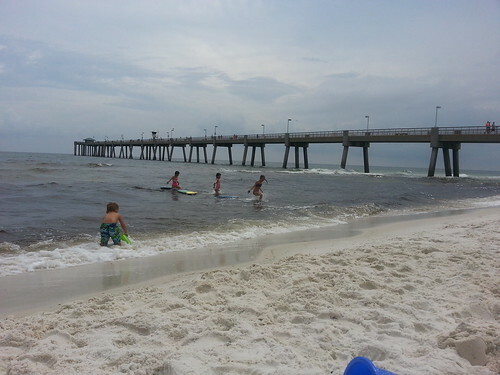 Again, we tried the gulf side. Still gross, but this time the kids could handle it. I sat myself on the beach and enjoyed the day. 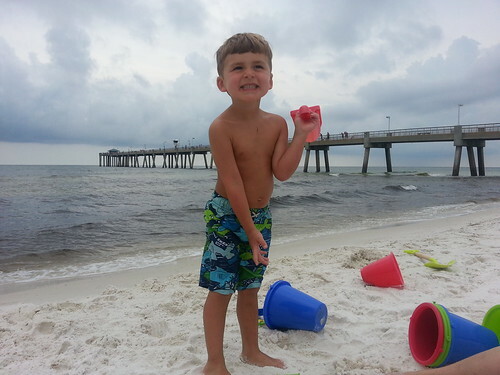 Luke loves to dig in the sand. Apparently, so do the girls. 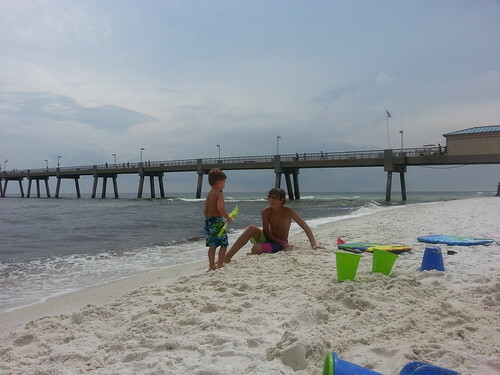 Luke had to wash off his shovel every time he used it because he didn’t like the sand touching his hands. It rained again, but this time it was right on the edge of us and it didn't storm. So, we stayed. Eventually we went back to Grandma’s house to meet up with Angela and have some dinner before returning to the camper.